Earn [urn] (Verb: used with object) 1. To gain or get in return for one’s labor or service: to earn one’s living. 2. To merit as compensation, as for service; deserve: to receive more than one has earned. 3. To acquire through merit: To earn a reputation for honesty. 4. To gain as due return or profit: Savings accounts earn interest. 5. To bring about or cause deservedly: His fair dealing earned our confidence. People learning about Copiosis get confused sometimes when they hear about net-benefit reward (NBR), what Copiosis rewards producers with when they make people and or the planet better off. People come to the conclusion that NBR, like money, is earned by a producer when they create net benefit. Even people who have been involved with Copiosis for some time use the word earn such as “After you earn your NBR, you can use it to buy luxuries.” “Buy” is another word misused in talking about Copiosis. You can’t “buy” anything with NBR because NBR is non-transferrable. You can’t exchange your NBR as “payment” for receiving a good or service from someone. I want to explain in this post why you don’t earn anything in Copiosis. Instead you are rewarded for your productive action that makes people and the planet better off. As a result you’re far better off living in a Copiosis society psychologically and practically. What did you do to earn the sunshine you enjoyed today? Did you do anything to earn the rains that replenish your rivers, the atmosphere that filters the sun’s harmful rays, leaving you with life-giving heat and light? Did you earn the planet itself, which provides you with so much in so many forms? What did you do to earn the heart that beats in your chest, or the trillions of cells that operate beyond your conscious awareness, sustaining your body, mind, and spirit while on this planet? What did you do to earn these? How about the billions of people who have contributed to the creation of everything you currently enjoy in this moment—bridges, cars, roads, homes, clothes, pets blankets, medical care, relatively peaceful societies, weather predictions, education, etc.? Most of the things you enjoy would not be around but for the lives of these people and innumerable non-human beings that came before you, including single-celled organisms, dinosaurs, all the way up to your parents, the elected officials running your city, and the many other people you will never know who are inventing things right now that will benefit you and that keep your life running smoothly. Do you think you can do anything to earn all that contribution to your life? I seriously doubt it. Yet, each of us benefits from these and so much more as nature, the environment, the Uni-verse surround us with life-giving abundance. There’s no way any one of us can do anything to earn all that we receive. Yet, nature, God, the Universe, or whatever you want to call all that has come before you continues to make your life possible. In response to this knowledge and awareness, early deep thinkers came up with the idea of debt. They believed man owed something to someone in return for all this. Somehow, through man’s quirky logic, debt to nature or God became debt to kings. I suppose this happened because kings were at one time thought to be descendants of, or at least ordained by, gods. So became the world we see today where you owe a debt to your parents, to your country, to your fellow humans. Earning a living has similar origins. We’ve swallowed the propaganda that comes with markets, money, and government, and the politics that run them—if you’re not earning your living, you’re a drain on society. You don’t deserve things you need to survive, or certainly to thrive, unless you earn it (through labor presumably). We believe this propaganda so completely we defend it, causing us to label those we believe aren’t “earning it.” We call them deadbeats, bums, welfare mothers. Is it possible to earn NBR? In Copiosis, we wipe all this talk of debt and earning. Copiosis reconnects us with all the things with which we are blessed. 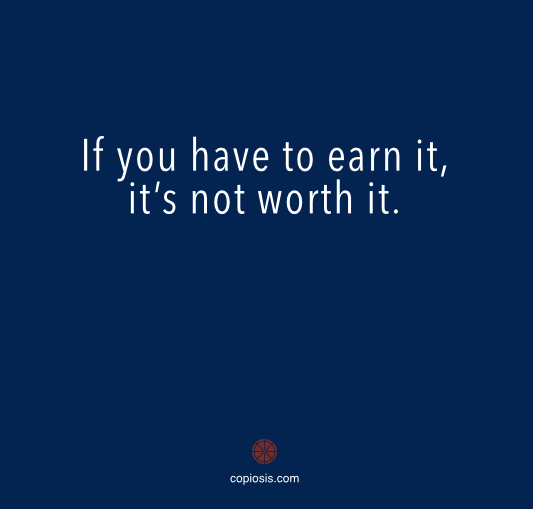 In this context, there is no need to earn anything. Producers who benefit people and or the Earth through their acts are not doing so to earn something. They are expressing themselves and their passion and in so doing practice their unique art of creation. Those creative acts are rewarded. NBR can’t be earned. There is no amount of effort you can do to repay society or the individuals you benefit from for blessing you with all that you receive. How much NBR producers receive is determined by our algorithm, which takes into account all the variables we believe are needed to make such a calculation. No person or group of persons is responsible for determining NBR—the algorithm does that. The process is administered and facilitated by the payer organization acting in behalf of humanity or human society. NBR then is a recognition of the blessings bestowed upon people who engage in the act of creation. Society rewards producers for the valiant effort they make to make the human condition more enjoyable, more worth living, more interesting, more efficient, more fun. Producers do this using their imagination, creativity, industry, and drive born of their passions. A producer who makes our biosphere more capable of supporting all life, remediates damage done in the past, or enhances the environment so that other species thrive, is rewarded for her initiative, her commitment, her passion for nature. She is rewarded for her stewardship of nature. No matter what it is producers do, they are all rewarded for creating more. More is what the Universe is all about. Some ardent resource-based economy (RBE) adherents and environmentalists believe more is a bad thing for people and for the planet. They don’t understand that nature is fundamentally in favor of more. The entire Universe is predisposed to “more.” If you don’t believe that, look around. There is more more in nature and the Universe than we can identify. We are still finding new species of life and new planets in the cosmos. Plants produce an overabundance of seeds. Our earth teems with more. More more is being created all the time. The upward spiral* is nature’s fundamental expression. Hold on now. You might be saying “But this reads very much like the definition for “earn” that began your post!” Notice something though—there is a key difference. A reward is something typically given in return for acts of good. Rarely are rewards given for evil, and when they are, in the context of the reward the evil deed is considered good by the rewarder. So while you can earn your money by doing all kinds of things, rewards are typically things given in recognition of an act of good. “Good” in Copiosis means “making people and the planet better off.” Any act that doesn’t fit this definition receives no reward. NBR in Copiosis is a method by which one part of the Oneness (humanity) acknowledges another part (an individual human being) for doing good for other parts of that same Oneness (other people or the planet). It is interesting, by the way, that NBR comes out of nowhere and, when used, returns to that nowhere place, or back to the non-visible part of the Universe, as I like to say. Recipients of NBR—producers—are acting on behalf of themselves (some act because they want luxuries, others for other personal reasons), yes, but intrinsically, even though they may not realize it, they are acting as agents of the Universe (the totality of known, unknown, and supposed objects and phenomena throughout space; the cosmos; macrocosm) to improve the state of the Universe, by creating realities consistent with the Universe’s predisposition for more. In other words, producers are rewarded with NBR for producing “more” and doing so in a way that benefits (not just protects) the Earth and the greater system in which we exist. In Copiosis you are completely free. This includes being free of needing to earn anything. You also are free of any kind of debt or incurring it. That includes the financial kind. Instead, you are blessed, and things are bestowed upon you. Some things require that you benefit others – by taking the responsibility of performing that role of producing more – in the ways you are best equipped. The ways you best perform and acting from your passions. In return for doing that, you are rewarded. All that you need to thrive is provided, as is sunlight, air, a planet full of abundance, etc., at no cost. Nothing in that regard is withheld from you, unless you act in ways inconsistent with the recognition that we are all in this together, whatever you believe “this” to be. Think about what this level of freedom means. You are not required to do anything you don’t want to do. You are free to go wherever you want to go, be whatever you want to be, consume whatever you want to consume, produce whatever you want to produce (providing you can enroll others in producing that thing), believe whatever you want to believe, live how you want to live, so long as you don’t violate the freedom of others. In doing all that, your fellow man will provide you with everything you need, just like the Universe does, just like your body does every minute of your life. Copiosis returns humanity to the Universes’ natural state, abundantly providing everything to everything. Recently an attendee at a Copiosis meeting said Copiosis is creating an “ancient future.” She explained that long ago there were communities of people, and when someone needed something, the community provided that thing to the person at no cost to him. It was seen as the natural thing to do. She said that Copiosis holds the promise of returning us to that civilized state, while maintaining all the technological advances we enjoy today. I love the idea of “Ancient Future.” It is a nice play on words. In this profound, new, and yet ancient, level of freedom, you will naturally want to express your gifts to the world. That desire may not develop within you right away as you wrestle with the indoctrinated beliefs you hold about the world as it is today and what is expected of you in that world. It will happen though because a giving heart is the foundation of what all of humanity is. It is generous, giving, life affirming, just like the rest of the Universe. It cannot be any other way, because it (humanity) is one with everything else. And everything else is generous, giving, life affirming. That’s what love is. That’s what you are. It’s time we create and then live in a society consistent with that to which the Universe is predisposed—abundance, freedom, joy, optimism, and an ever-expanding desire for more. More beauty, more love, more experiences, more adventure, more exploration, more discovery, more generosity, more giving, more creation, more, more, more. This is what Copiosis is about. It is the basis of the Universe. And it is the foundation of the concept of net-benefit reward. Not earning. You earn nothing in Copiosis. And you don’t need to because you are blessed with everything. *Paul Krafel’s hour-long video is hard to get through at first, but those who stick with it are richly rewarded. « Will humans become obsolete?